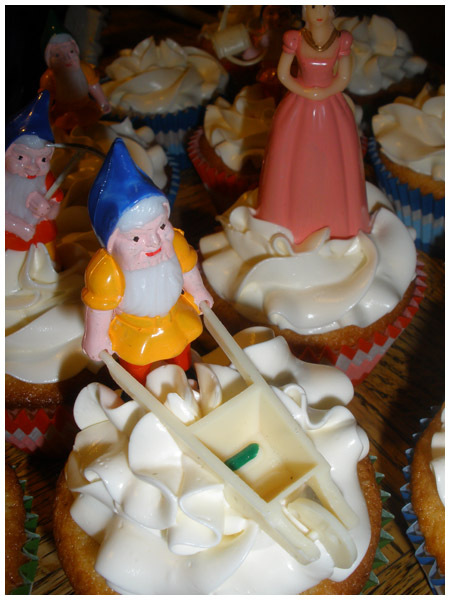 My vintage hand mixer & some vintage “Snow White” cupcakes. I’m back! With a new recipe (well, actually two) just like I promised, and on top of that… a really long post! A few weeks back I was helping clean out my grandmother’s kitchen cabinets and I made a real gem of a find. 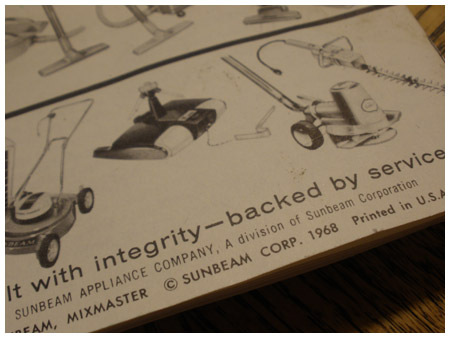 All the way in the back, tucked in a corner buried underneath a ton of other stuff, I found a brand new, mint in-box, never been used silver & white Sunbeam Mixmaster hand mixer from 1968. Yes, seriously, 1968. I was psyched. If it’s one thing I love, it’s anything retro or vintage. Unfortunately it wasn’t in one of those spiffy 1950’s/1960’s colors like pink or aqua, but it’s still pretty damn awesome. If it had been pink, and matched Lola, I probably would’ve died right there on the spot. But I digress. Jay said it would be an awesome thing to have on the wall when I open my bakery (one day…) and I have to say, I agree. It’s 100% useable, I used it to make these cupcakes (but not the frosting, I only trust Lola to make any kind of meringue). But if I ever open a bake shop, I’d totally hang it on the wall. 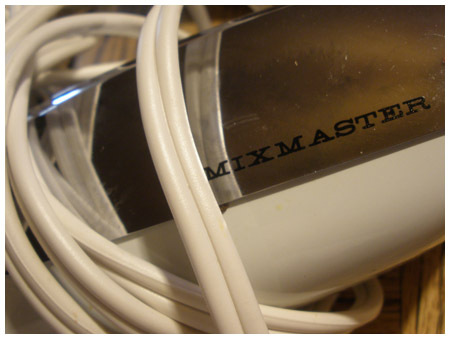 I think I might actually start collecting retro mixers, it would be an awesome thing to have a bunch of them hanging on the wall (or have some vintage stand mixers on a shelf or counter) in the kitchen… or my future bakery. And if any of you steal that idea, I’ll come find you and put your lights out. Don’t test me! I’ve been ripped off and copied enough. So basically, now I’m stalking websites like this, this & this. 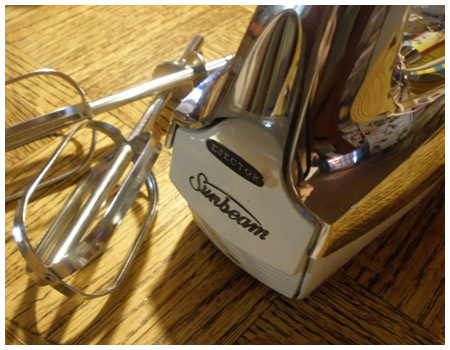 I think I need a vintage KitchenAid stand mixer in pink and a Sunbeam one as well, don’t you? 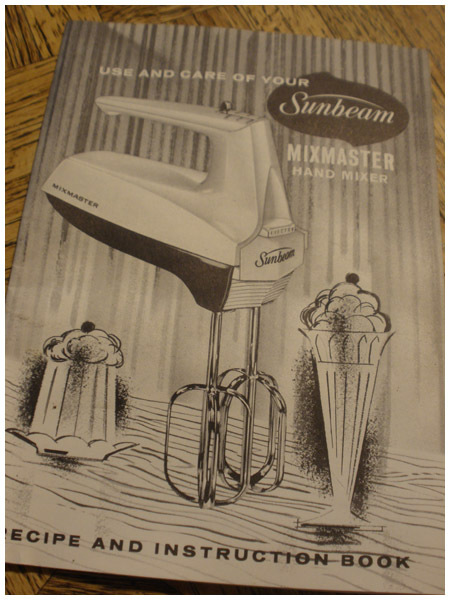 One of the coolest things about this little mixer (aside from EVERYTHING) is that it works perfectly, and even better- it came with a little booklet of instructions/recipes complete with awesome 60’s line drawings. Don’t you just love old cookbooks and recipes? So combine me finding that lovely gift with the fact that I was inspired by the cupcakes at my girl Sami’s wedding… and you have… well, a new Cupcake Rehab post. I chose to make Sunbeam’s “yellow” vanilla cake (as seen above) into cupcakes with a vanilla swiss meringue buttercream. I changed the cake recipe a bit because I wanted to use butter and not shortening. I’m going to give my instructions for turning it into cupcakes while leaving the integrity of the original recipe intact. If you have any questions, please don’t hesitate to ask. 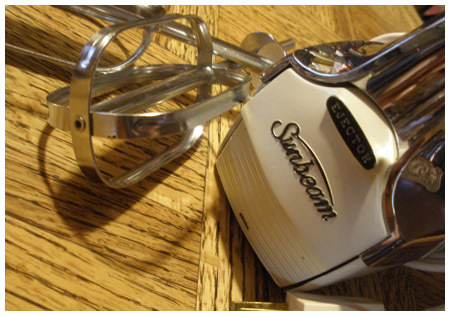 I recommend listening to The Crew-Cuts or Bobby Darin while making these, especially if using a vintage mixer (yes I know neither of those are from 1968, sue me). 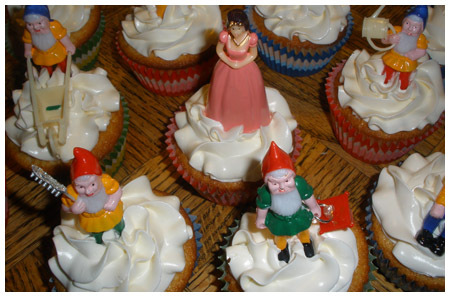 To carry the whole retro theme even further, I put them in retro striped liners and topped them with adorably awesome Snow White & the Seven Dwarfs cake toppers, both from sweet estelle’s baking supply. Thank you to Yoyo for buying me these toppers, they are super duper cute! This batch of cupcakes reminds me of cupcakes that would be served at a kid’s birthday party in the 50’s or 60’s. Love it. Set oven to 375 degrees F to preheat. Line two 12-cup muffin tins with cupcake liners (or grease two 8″ cake pans). Sift together the flour, sugar, baking powder and salt. Add the butter; pour in the milk and vanilla. Beat until blended. Stop, scrape sides and bottom of bowl, and add eggs. Beat 1 ½ minutes. Pour batter into liners between ¼ and ½ way full (they rise a lot!) 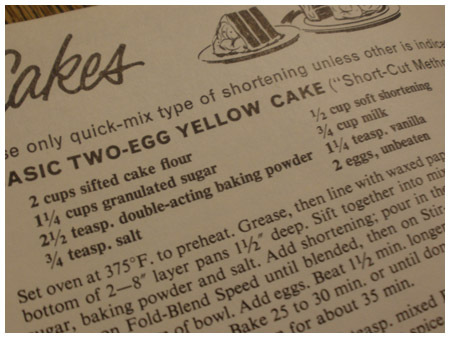 or fill the two greased 8″ cake pans about 1 ½” deep with batter. Bake for 20-30 minutes or until done. Let cool completely before frosting. Some people find Swiss meringue buttercream to be tricky, and I used to as well. But if you have patience, and follow the directions correctly, it’s so worth it. It’s the best frosting ever. I always had problems with it and then one day, miraculously, I just “got it” and it all came together. It’s one of my favorite frostings. If you have difficulty with it, just remember, KEEP BEATING IT. 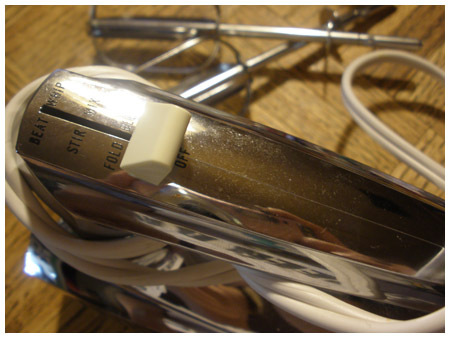 It needs a LOT of beating, and make sure when you first start to beat it with the whisk that you do so until it’s completely cool and the bowl itself is cool to the touch as well. And after adding the butter, if it looks odd, like it says in the recipe, that’s normal. Keep beating it, it’ll come together. The cupcake recipe makes exactly 24 and the frosting recipe frosts exactly that many cupcakes, but can also be doubled or tripled if need be. Happy baking! Next Post Happy birthday to America (& my mom, too)! 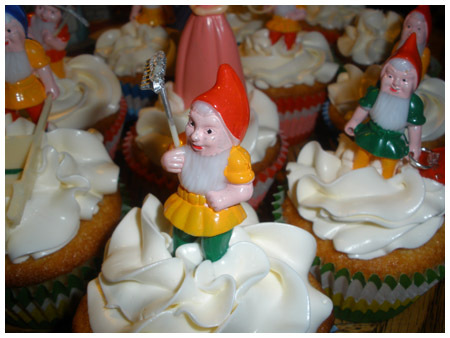 Love the retro look of these cupcakes!…..brings me back to my childhood…..well,sorta….Mom didn’t bake..but If she did…these would be the cuppies I would have wanted! Thanks Mara! I thought they looked pretty spiffy myself 😀 I love the toppers, they look old but they’re new. AWWW THOSE TOPPERS ARE SOOOO CUTE! Brings me right back to my childhood in the 50’s. I am 60, a single mom, and a grad student, but these memories will always comfort me. I treasure the old vintage look, and this one sure hits the mark. Aw I’m glad it brought back good memories for you! Still, the posts are very quick for novices. May just you please lengthen them a little from next time? as I’m looking to create my own personal blog and would love to learn where you got this from or what the theme is called. I was studying some of your posts on this website and I believe this web site is rattling informative! Well I sincerely enjoyed reading it. This tip offered by you is very helpful for good planning. Hi, i believe that i noticed you visited my weblog thus i came to return the favor?.I am attempting to to find things to improve my web site!I guess its adequate to make use of some of your ideas!! Hurrah, that’s what I was looking for, what a information! present here at this website, thanks admin of this site. I most surely will make certain to do not omit this site and give it a look regularly.